Many IBM eServer iSeries clients have passed the initial phase of adoption of IBM WebSphere Application Server for iSeries. And now with the best practices presented in this book, they can build robust, high available solutions, based on WebSphere Application Server. 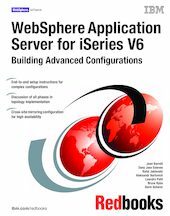 This IBM Redbooks publication is designed to help system architects, WebSphere administrators, and software developers. It provides a detailed discussion about planning. Plus it provides implementation instructions to help build a complex solution, based on WebSphere Application Server for iSeries. In addition, it provides many useful techniques and tips for such an endeavor.